1-2-3 Action! 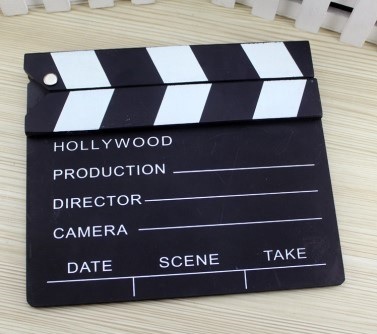 NOW your students can get excited about role-playing with this Hollywood moveable clapper. You can write in with chalk: Scene # and Take # and erase for the next scene. It's just like the real thing. Student can take turns being the Director. They can ask the actors, "Are you ready?" and then say, "1-2-3 Action!" and shout "CUT!" when the role-play is finished. Perfect supplement for Little America's NEW children's text "1-2-3 Action!" or your own role-playing in class. Enjoy!